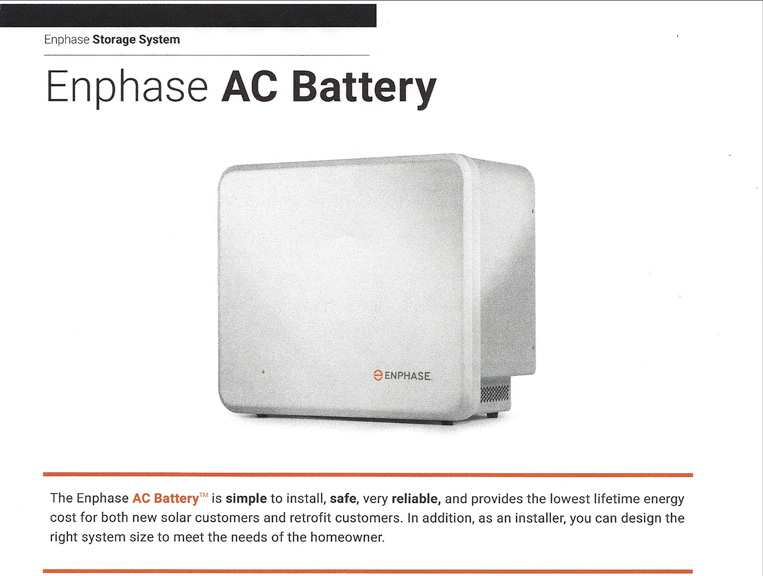 Enphase Solar AC Batteries, a new era for energy independence. - Synergy Solar & Electrical Systems, Inc.
A few years back, Synergy made the decision that we would focus our new sales on the Enphase Energy Inverter platform. One of the main reasons for doing so, was because we felt it was critical for our company to be able to proactively monitor our customers, not to wait for them to call us when they thought they had a problem. For the customer, it required us to schedule a time to visit them, and often the issue had been going on for quite some time before they noticed it. For Synergy, often we found either the system running fine, a breaker tripped or the inverter had been down for a few months. It often took a week to order and receive the new inverter and then another call to replace it. This has all changed since going to the Enphase platform with performance monitoring. When a customer’s system has an inverter or panel that fails, we are notified via email at once. We can go to the Enlighten Web-site and see the performance of individual panels and the roof as a whole. When discussing a bill with a customer and/or how the system is performing, we have access to real time data. I have both a string inverter (SMA) and micro inverters on my own house. I have monitored both systems since they were installed. The biggest difference for me, is that the enphase system is designed around monitoring while with the SMA it is an option. With Enphase I am able to see each panel’s performance, not just the system as a whole like SMA. And with Enphase I can update the firmware of the inverters and monitoring to keep them current. With Enphase’s new Envoy S, with revenue grade metering, I have added my string inverter to my Enphase system. I still cannot see the individual performance of my SMA inverters, but I am able to get all my performance data in one place. Below, please see a sample of one of our customer’s performance monitoring systems. Some of you may have noticed that the screen above not only shows the performance monitoring of this customer, but also the consumption used. About 6 months ago, Synergy helped beta test the Enphase Envoy S with consumption monitor, and we have been installing it as a standard feature every chance we get. 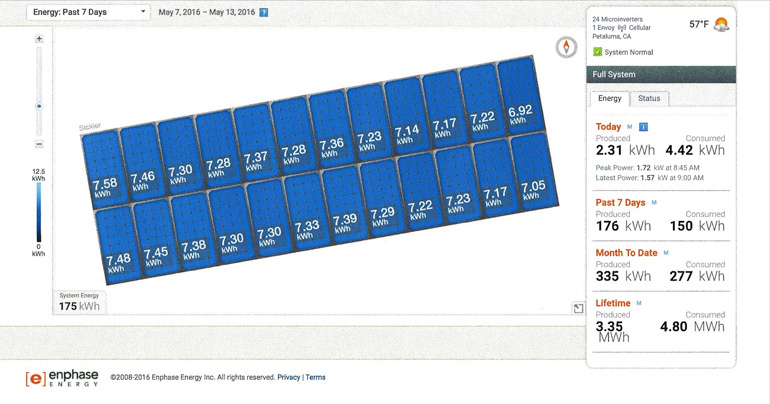 The performance monitoring is great, and when you combine production of a solar system, with consumption, the customers usage, then you really have a fantastic view of your energy environment, customers love this! 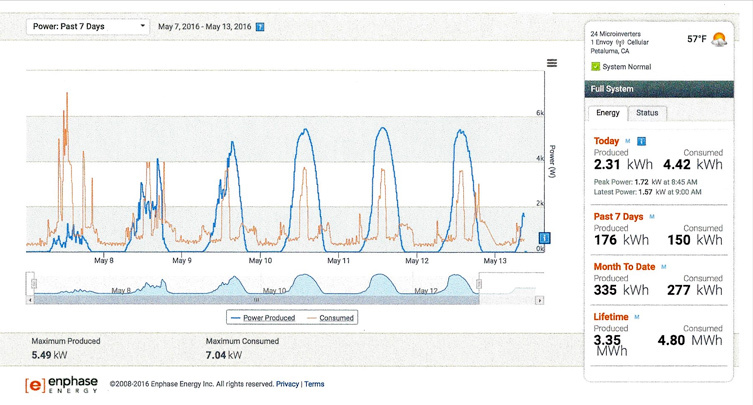 You can see daily trends, monthly totals or notice 15 minute intervals throughout the day of how power is consumed. For example, when your electric car is charging, when your electric heat pump is running or when the hot tub kicks on, you can see how this increases your energy usage. And for those who live in the country, you will see when your well pump is starting to clog, using more energy and thus avoid ruining the pump. I have one customer who turned off his older hot tub the day after going solar because he saw just how much power it was using. He has a new more efficient hot tub on order. See below: the 7 day rolling graph of consumption vs. production for the same customer as above. Consumption monitoring also serves to help us with the next phase of energy management, storage. By the end of this year, Enphase is slated to release their new AC battery (https://enphase.com/en-us/products-and-services/storage ). Storage provides us with both a tool to manage our utility costs and a way to provide energy to our homes when the grid is down. Managing our energy is becoming more important as solar continues to gain market share and as utilities like PG&E keep moving the peak windows farther into the late afternoon and evenings. Peak energy costs as much as twice the cost of off peak rates. Solar has benefitted from solar’s production during peak, as it off-set a large part of their off peak rates. As “Peak” moves, we are producing less power during peak, and more on off-peak (less credits). Intelligent storage systems will allow us to draw power from storage systems that the house is using during peak times, recharging when rates are lower (off-peak). This will allow a better way to manage our solar systems. All grid tie systems being installed today have Islanding; they do not allow power to be exported to the utility or used by a home owner when the main power is out. The second phase of the Enphase battery release will address this issue. They are proposing that with an intelligent transfer switch, power will be transferred from the utility to the battery system. With batteries, the inverters on the roof will see power and thus continue to work during daylight hours. This will allow these systems to use BOTH the power being generated by the sun and the batteries during the day as well as the batteries during the evenings. Because of this design, battery banks can be sized smaller. And back to consumption metering, with the history provided by the Enphase system, systems can be sized more accurately (many systems being proposed today are a guess, even with load analysis – they lack actual time of day history). Why the Enphase storage system over the others that are out there? The thing I like best, is pairing of a micro-inverter with the battery, all inside the case. Thus the output of the battery is AC, not DC like most batteries. You can not beat the integration of the Enphase batteries when coupled with the Enphase inverters controlling the solar on the roof, and even if you do not have Enphase on the roof – it will still work well with other inverter manufactures, or hybrid environments like mine. Enphase has always been a leader in creating a truly integrated, intelligent platform that is easy to add to as future products enter the market. Storage is no different and an easy add-on without the cost. Okay, these issues are a little more technical, but still important. Efficiency: since Enphase AC batteries do not need lower efficient off-grid inverters, their conversion loss from AC to DC can be half of their main competitors. Weight: one of the most popular systems being marketed today has a battery that weights 220 pounds (This will put a little downward presage on any wall, what if you need 4, almost 1/2 a ton), compared to a much more manageable 55 pounds for the AC battery. While most batteries use lithium Ion technology – it is not the same. Many systems use COBALT, which combusts when it comes in contact with air (has been the culprit of many recently documented fires). Enphase uses Lithium Iron, which is not prone to catch fire, unlike Cobalt based batteries. So why am I such a fan of Enphase? It is their vision to move beyond solar into home energy management. Enphase has the “Apple” philosophy of keeping it simple so the average person can use and understand it. Finally, the products they develop are mostly backwards compatible therefore protecting a customers investment. What does the future of solar hold? My guess is integration to electric vehicle batteries, Micro Grids, home automation management and intelligent integration of appliances. What might this look like? On a cold winter Thursday in a neighborhood in the not to distant future, the power goes out, the home automation system knows which appliances it does not need in a back-up power situation. So the hot tub, electric oven, and pool pump are turned off. The battery charges during the day and keeps Joes house heated (heat pump) and refrigerator cool. Joe returns to his home in his electric car from his job in the city, with only a 20% charge available and he needs to get to work in the morning. Not a problem, he does not need to choose between heating his house or powering his car,he goes to his neighborhood micro grid and borrows the energy need from the folks’ EV’s down the street that use them primarily on the weekend or the neighborhood shared storage bank (he will feed it back when others need it most). Thus the community becomes more independent, closer knit and helps each other when they need it. I am excited for these new technologies as they come on-line, and know that my partners will continue to develop the technologies need to keep my customer’s systems connected to what the future holds. You stated in the above ” Enphase uses Lithium Iron, a combustible material”. Did you mean to say “non” combustible? You are correct – thanks – change has been made – Nice seeing you today.